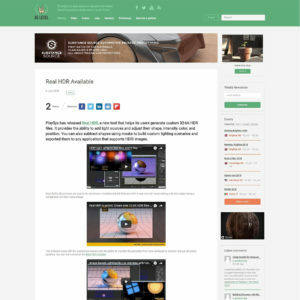 There are sites and posts with software reviews about Real HDR and I think it is proper (and funny) to review these websites in exchange. 3dnchu – that translated should mean “3D people” – spoke about us HERE the 20th of June 2018. 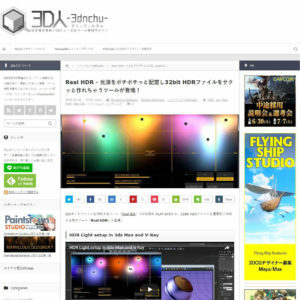 The site is entirely in Japanese language and they cover a wide spectrum of software and plug-ins for CGI and VFX. They were the first to discover our tool but we knew each-others since the times of early Real IES releases. The authors have also a constantly updated twitter account @ymt3d and is involved in gaming industry since 2007. There was also a previous blog before 3dnchu named Jimdo so the author has a quite long experience in divulgation too. The king of reviews and press releases about 3D computer graphics. 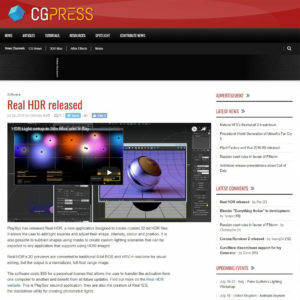 if there is a software worth looking for, it is on CGPress. We got reviewed by them few times for our Real IES releases and recently for our Real HDR. HERE is the link if you want to read their opinion. In the review they mention the price of Real HDR but with the upcoming release we are going to raise the price since there are new features and possibilities (and this takes more time than before the be updated and expanded). As customers we are used to this, but just in case you’ll notice this difference of price, it is because they referred to the first release of Real HDR, the 2nd of July 2018. Seeing the name in uppercase is quite strange, I am more used to to refer them as 80lvl or 80lv. They are the ultimate source of information about people behind the CGI scene, doesn’t matter if it is for video games, movies or competition. About our Real HDR on 80.lv pages, we got reviewed on July 2nd and we got an impressive amount of shares. You can share too fomr THIS url.